Up to Jaisalmer we were always lucky. None of us became sick, the weather was always nice, we didn’t get scammed, we haven’t missed any flights, buses or trains or any other travel annoyances. Things got a little less fun for me in the Golden City. Jaisalmer is located in the Thar Desert, 100km from the Pakistan border. It is famous for its fort, a still inhabited sandstone castle. You reach the inside through the only gate, specially made of steep turns to prevent attackers from gaining to much speed. The Fort is a small city with very narrow streets full of fabrics shop and small restaurants. You’ll find no cars there, only a few motorbikes which I loved. 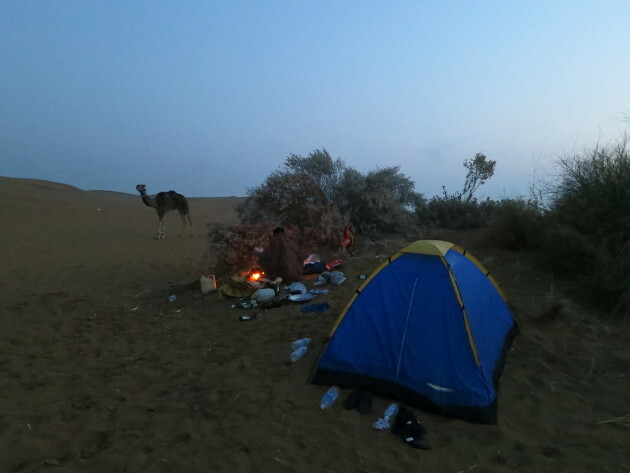 One of the biggest attraction of the region is camel safaris. We booked our one night safari from Trotters which had good reviews and provided us with great service. Unfortunately, our luck left us on the morning the safari started! The blue sky went away during the night and the clouds took over the sky. No beautiful sunrise and no hot weather (we wore sweaters the whole way) for us. Being in a desert with no blue sky is not the experience we were expecting! Worst, it rained during the night. Luckily, the agency had planned to bring tents. The next morning was better on the weather side but I wasn’t. Of course, the desert was the best place for me to become sick! The camel ride back to the jeep was not fun at all. I ended the day sleeping for the next 24h! On a side note, a camel ride is not relaxing at all and hurts quite a bit! It was still a really cool little adventure. We were accompanied by a very nice French couple and the guide was very friendly which added to the experience. 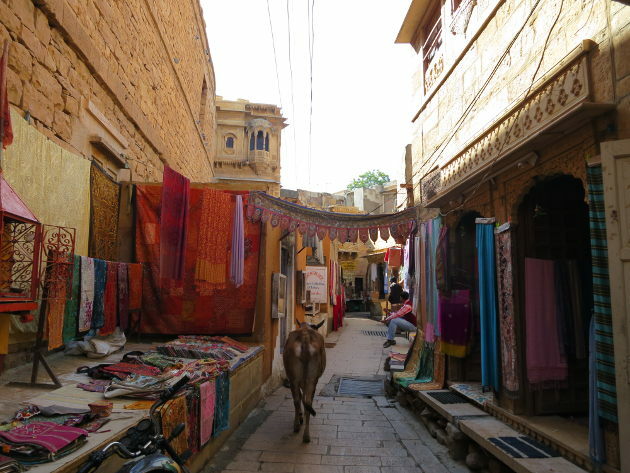 We ended our stay there with a visit of the museum which is located inside the old Maharajah palace and which offers some good info on the history of Jaisalmer. We also visited the Jain Temples which have some beautiful sandstone carvings (be ready to be asked for donations at every corner). We finally hoped on our last (and longest ride - 17h!) Indian train to Delhi, our last stop.